Do you ever look at the clock and wonder where the day went? You spent all this time at work and didn’t come close to getting everything done. Tomorrow, try something new. Use the Pomodoro Technique, originally developed by Francesco Cirillo, to work in focused sprints throughout the day. In Pomodoro Technique Illustrated, Staffan Nöteberg shows you how to organize your work to accomplish more in less time. There’s no need for expensive software or fancy planners. You can get started with nothing more than a piece of paper, a pencil, and a kitchen timer. This title is also available as an audio book. I would strongly suggest getting Pomodoro Technique Illustrated if you plan to learn or at least try the Pomodoro Technique, even more so if you plan for the year is to be more productive! This is an easy read with a life-changing message to all of us who have “too much to do and not enough time.” Since Staffan introduced me to the Pomodoro Technique, I have become a better person, both professionally and in my private life. This is a book I wish I had read years ago! 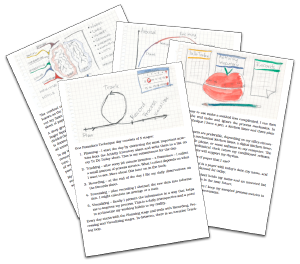 The Pomodoro Technique is the one action-planning technique that fits exactly as conceived into Agile approaches to projects. If you want to learn the technique and become excellent at it, you need this book. Staffan brings humor, examples, and a step-by-step approach to making the Pomodoro Technique work for you. Your overall estimates will become better, and you’ll get more work done. The Pomodoro Technique is amazing in its simplicity and its power to make you more productive, and this book is the perfect introduction to the technique. Author, "Grails: A Quick-Start Guide"
Staffan gives us the theory and practice of Francesco Cirillo’s Pomodoro Technique in an enjoyable package with wonderful illustrations. This is a delightful and useful book! You have so much you need to accomplish today. Your list is a mile long and you find yourself getting interrupted every other minute. You’d like to tell everyone to leave you alone, but most of the interruptions are coming from you! You think of a phone call you need to make or a web site you need to check and before you know it you’re answering email, checking Twitter, and finding a million other things to occupy your time. You need to focus—really focus. The Pomodoro Technique puts you back in charge of your day. You’ll apply successful techniques from software engineering to identify what you should be doing today and to help you achieve your goals. Your mind won’t wander when it is fully engaged in short bursts of focused activity. Learn to work less and accomplish more using nothing more than paper, pencil, and a simple kitchen timer. Set the timer and start on your next Pomodoro. When the bell rings take a break. This personal approach to timeboxing is at the core of the Pomodoro technique and this book is filled with advice on how to get started and how to tailor it to your own needs. Staffan Nöteberg has 20 years of experience as a freelance software developer, Agile coach, and conference speaker. He lives in Stockholm, Sweden and Istanbul, Turkey. And he’s not only focused on his own productivity; he’s also passionate about helping all kinds of office people to improve their personal time management.